Check in time betwen 8:00pm to 11:00pm: 10â'¬ charge. Check in time betwen11:00pm to 00:00: 20â'¬ charge. Reservation cancel 48h before check in. Other case company charge the first night. Age Ranges 0-12 and 12-18 only accepted with an adult responsable. 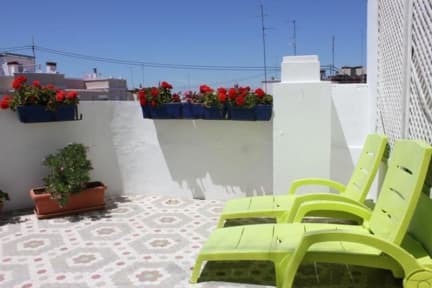 Located just 100 metres from Paseo de la Alameda Boulevard, B&B Hi Valencia Cánovas is less than 1 km from Valencia's old town. It offers simple, attractive accommodation with shared or private bathrooms. All rooms at the Hi Valencia offer bright, modern décor and each has heating and a fan. All rooms also have a TV. The guest house serves breakfast and is within walking distance of a good selection of cafés, bars and restaurants. Valencia’s old town and cathedral are less than 1 km away. The Carmen district and Valencia Cathedral are less than 1 km from the property. Colón Metro Station is a 10-minute walk away and is 1 stop from Valencia Railway Station. Malvarrosa Beach can be reached in 10 minutes by Metro. Important information Please note, rooms are cleaned every 2 nights of a guests' stay and towels are provided. Guests are kindly requested to inform the hotel in advance of their estimated time of arrival. This can be noted in the Comments Box during booking, or by contacting the hotel using the contact details found on the Booking Confirmation. Guests arriving outside reception opening hours can check in using the hotel's check-in machine. To receive the password, please contact the hotel prior to arrival using the contact details found on the booking confirmation. Basic Single Room: This room has a single bed, heating and a fan. It includes a TV and free Wi-Fi, and offers access to a shared bathroom. Standard Twin Room: This room has two single beds, heating and a fan. It has access to a shared bathroom, located next door. It also offers access to a communal terrace. TV and Free Wi-Fi is available. Basic Double Room: This room has two single beds, heating and a fan. It has access to a shared bathroom, located next door. It also offers access to a communal terrace. TV and Free Wi-Fi is available. 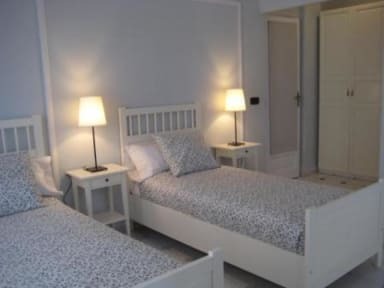 Superior Double Room: This spacious room has a double bed, private bathroom, heating, fan and A/C. Free Wi-Fi and a TV. Superior Twin Room: This spacious room has a small seating area. It includes a TV, fan, free Wi-Fi and a private bathroom just outside the room. Standard Double Room: This room has a double bed, heating, fan, TV and free Wifi. The private bathroom is located outside of the room. Basic Twin Room: This room offers bunk beds, heating, fan, TV, free Wi-Fi and access to a shared bathroom. 72 hours before check in. In case of No Show or cancellation delay a penalty of one night room and tax will be charged on your credit card. Cancel conditions: 72 hours before check in. In case of No Show or cancellation delay a penalty of one night room and tax will be charged on your credit card. Minimum payment credit card / debit € 100. Cafeteria: La Casa de la Orxata. - Coffee with milk, American coffee, express coffee or tea. - A piece of big pastry cook's shop (croissant) or two pieces of small pastry cook's shop.